Normally we see gorgeous, perfect Monarch butterflies being shown on blogs, and photo sharing sites, but there’s another side of their lives that shows us just how amazing and remarkable these insects are in addition to beautiful. This Adult Male Monarch Butterfly has survived the wind, rain, and maybe snow. It probably avoided predators along its arduous migration, and perhaps it lost some of its wings being snagged on thorns. The average lifecycle of a Monarch Butterfly is 6-8 weeks. From the egg stage, then the catepillar stage, to the chrysalis stage is only 27-28 days. At 28 days the Monarch Butterfly emerges from its cocoon a fully grown monarch and lives 2-6 weeks. That’s remarkable! From that point its whole raison d’être is to mate so there will be eggs to lay so there will be the next generation of monarch butterflies. I love how clever he is by landing here on this withered and tattered Showy Daisy-like flowers. He’s trying to blend in I believe. I made this image in May in Santa Clara County. It’s back to my archives this week because I have been outside my box, and doing a bit of portraiture the last two week-ends. Two weeks ago a girl-friend and I teamed up to do a Maternity Session for some dear friends, and I’ve been working on those images, and this past Sunday afternoon I did a Wedding Invitation/Save the Date session for Baby Girl, and the Handsome Surveyor. I can’t show any images from the Maternity Session as the couple hasn’t seen them, and I don’t have their permission to share yet, but Baby Girl and The Handsome Surveyor said it would be alright to share one image; one that won’t be used on the invitation. People photography really isn’t my thing, and retouching even less so, but I do like this image. Of course, I am just a wee bit biased. 😃 I will probably go back and tweak this image after I get the Maternity Set done for my friends, and Baby Girl’s wedding invitation image done. I’m not used to working on the clock so to speak, so I’m feeling the pressure! I hope your week is going well, and you all have a lovely week-end! On Sunday I proposed a different route that would take us along meadow and grassy trails, but still be hiking uphill, and if I didn’t run out of steam I’d even go up the wall. Our mileage wouldn’t much over two miles, but the elevation gain would be close to 600 ft having to go uphill to the top of the mountain/hill then down to the valley and back up the steep hill, and WALL then down the back hill to the car. I saw several wildflowers in bloom, there were fiddle necks, Hounds Tooth, Pacific Pea; Lupine; and a few others, but the best came when hiking up the hill leading to the WALL. He-Man was well ahead of me because I kept stopping to photograph flowers, new pine-cone buds, a lizard in camouflage or so it thought, so I was making tracks trying to catch up before he hit the WALL- which is the last section of this hill, but it’s nearly vertical. I’m not kidding it’s really steep. The grade must be 9 or 10%. Everyone calls it the Wall. Thankfully it’s fairly short from there to the top. Anyway, I was looking high, low, and sideways for flowers, birds, insects, etc, and in a thicket of dry and dead thistle or teasel I spied something like leaves, and kept going up the hill a few steps then my brain said, ” uh, no there shouldn’t be leaves like that on those, back up!” So, I did and look what I saw when I really looked at it! A pair of Silvery Blue Butterflies en Media Res! I have never seen this type of Butterfly before and never in this position! I was so thrilled and excited; doing my happy dance! The Silvery Blue is in the Gossamer-Wing Family. Its habitat is varied but, not in deserts, but there is an exception as they are found in the Mohave Desert. They are found where there are Lupine, Pea family, and Vetches. All of which were present when I saw these two. Their season here is Feb- Aug. I was so grateful to have seen this. I’m still Wowed by it! I’ll share some of the wildflowers in future posts. I’m pretty sure this is a Skipper, but I can’t find anything that looks exactly like it in my books, or online so, don’t know what it is. I found it in Point Reyes National Seashore last week-end; July 9,2016. Anyone know what it is and what it is called? …and a grub or grasshopper served a la carte to a White Crown Sparrow that is banded. It’s the first time I’ve ever seen a banded sparrow. Week 44! Can you believe there are only 8.5 weeks of 2014 left! The year has flown by. 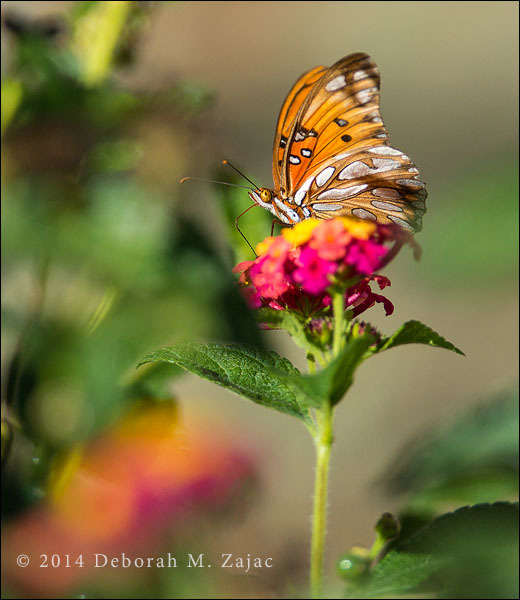 This Gulf Fritillary was fearless! It came to my Lantana while #1 Grandson was out in the yard playing. I had my camera nearby so grabbed it and captured quite a few images of it. I made this image yesterday afternoon. I wish more critters, and insects were as brave as this one.